Community sentences in England and Wales are to be made more "female friendly" in an effort to keep women out of prison. Justice Minister Helen Grant wants to cut reoffending rates and offer judges credible alternatives to custody. She says "vulnerable" women offenders need help to break the cycle of crime and abuse many of them face. But the new approach will include an element of punishment such as unpaid work or curfew, she stressed. Ministry of Justice officials insisted the aim was not to lock up fewer women offenders, but to reduce the number of reoffenders and to make "credible" alternatives to custody available to judges. About 4,000 women are currently in jail in England and Wales, most of whom are serving sentences of six months or less. Eight out of 10 were sent to prison for committing a non-violent offence. Ms Grant is setting up a new advisory board to overhaul community orders for women and look at other issues such as locating female prisoners near to their families. "Many female offenders share the same depressingly familiar issues of abuse, drug and alcohol dependency and mental health problems," said the Conservative minister. "Women who commit crime should be punished, but we must not forget that a significant number have been victims during their lives and need targeted support to break the cycle of offending. "I will provide the strong leadership required to drive these priorities forward and I'm confident that by working together with all partners we can better tackle female offending." Expanding on the proposals in an interview with The Independent, she said: "Women offenders are a highly vulnerable group, they commit crime because of that vulnerability and earlier failures to protect and support [them]." 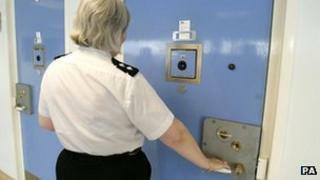 The Ministry of Justice said it costs £45,000 to keep a woman in prison for one year, while almost 45% of all women released from custody in 2010 reoffended within 12 months, committing more than 10,000 further offences. Up to 56% of women offenders have been in care and the proportion of female prisoners that report abuse in their lifetime is double that of males. In addition, about 60% of women leave behind dependent children when entering prison. Prison Reform Trust director Juliet Lyon broadly welcomed the government's stance but said it would have little effect if it was not backed by new laws. "History shows that, in the absence of specific legislation, commitments to address women's different needs are often not realised, and momentum can be lost as ministers and officials come and go." Andrew Neilson, director of campaigns at the Howard League for Penal Reform, said the proposals lacked detail. But he added: "It does, however, reflect the fact that community sentences are a far more appropriate way of dealing with the vast majority of women currently in prison, including all those who have committed non-violent crimes." The government is also considering the introduction of "secure hostels" for less serious women offenders in England and Wales, as an alternative to women's prisons.